My past Saturday may be of interest if my experiences were brand new for you or may not be of interest if they are old hat to you or you don't care if you ever do such things. Cheating a little bit I did have a preview of the Human Library and wrote a little bit about it in a newsletter. The Human Library was given a promotional run at the most recent art crawl. It was a strange concept, but I realized that it had a lot of potential. What is a Human Library? Think about why do you go to the library in the first place. To gain some knowledge and some enjoyment. You pass by interesting people every day, but you are pressed for time and a little inhibited from stopping them to have a little chat. The Human Library is really a conversation with an interesting person with admittedly a time limit (it goes too fast). The conversation can go in different directions, but you can initiate your own questions based on your own curiosity. Sounds like a good reason to visit the library. This past Saturday the Hamilton Public Library organized over 10 humans at each of 4 branches. I had lots of interesting choices and wished I had more time. Picture sitting down on two chairs around a table surrounded by other readers and human books. Well, it doesn't have to be that way. You can walk around the library and find a more private place which I and many others did. Because I work with The Rider I chose one woman who although disabled had ridden horses. My ignorance of riding is profound although I talk to riders almost every day trying to squeeze an ad out of them. Disabled riding is part of The Rider's coverage and I had a vague idea about it, but my human resource gave me a better understanding. For starters there are a variety of disabling situations. My contact had a form of rheumatoid arthritis at an early age, by which time she had already formed an intense involvement with horses. A good thing too, because to maintain her involvement she had to overcome obstacles and eventually she shared her interest and her education with others to help form a group offering riding as a therapy for disabled people in her area. I learned that adults as well as youngsters who have become disabled are welcome for equine disabled rehabilitation therapy and it can have benefits at any age. Many of them had no background with riding but came to understand it had a lot of benefits. One was the simple ability to improve their balance because of the demands of merely staying on a horse. My information source pointed out that as they practice, their self esteem was boosted because although they have had trouble moving around, they now are able to control a thousand pound horse. Our conversation veered in other directions. I know people who have had knee replacements, but I learned a few more details. We actually got into library concerns and again I got an interesting perspective. My next human book turned out to be a famous author. At least famous to me as I had actually bought one of his books (usually I read library or borrowed books). We didn't talk so much about the inspiration for books as how publishing contracts work and books are promoted. After a struggling author (who usually has a day job) finally gets acceptance enough to get a book published they then seek out a contract. One point my source emphasized was that there is always a deadline. One of his books (the one that I had bought) was given a lot of slowly developing interest through book clubs. Book clubs come in all shapes and sizes (I will be checking this out), some very formal and others just a group of book reading housewives that just like to discuss what books are worth reading. This is the true word of mouth and my writer contact with earlier books had gone this route and learned that it paid off for later books. Our conversation got into inter-racial and inter-ethnic relations and I admit there was a bit of self examination on my part. A few general exchanges that gave me a better idea of a man who writes books I enjoy. I will be reading more. Going back to my preview experience with an older woman Human resource who did disclose her age which was enough to have had a long interesting life. She had been an entertainer for many decades and had crossed paths of some very interesting people including Richard Nixon and Frankie Laine (someone a college colleague greatly admired). We got off on different topics. I was very impressed with her poise. She told me of her personal life that was interesting as well. The same night as the Human Library my daughter Heather steered my wife and I to Rapscallion, It is uniquely for meat lovers. I may not quite qualify as a heavy meat eater, but it was fascinating the wide variety of meat products offered. In fact it was pointed out that I ate more than my fair share and I plead guilty. We had many helpful explanations of what we could choose. They believe in experimenting and changing their menu. We started off with a chacuterie which included a sampling of 7 different meats with some bread and pickled hors d'oeuvres. I learned that they make their own bread and condiments which added to the enjoyment. 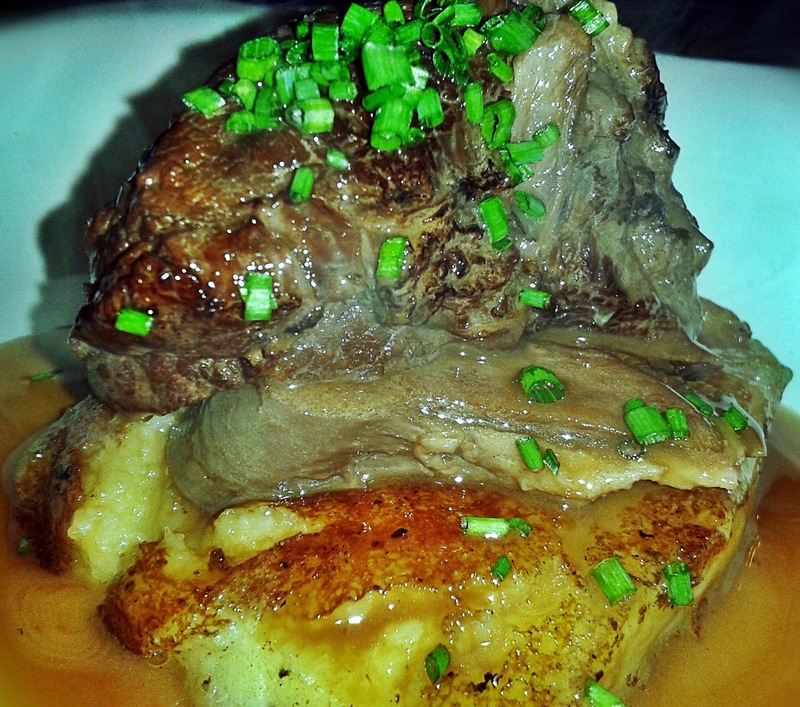 For our entrees we chose tongue n cheek, Korean beef and roasted bone marrow. 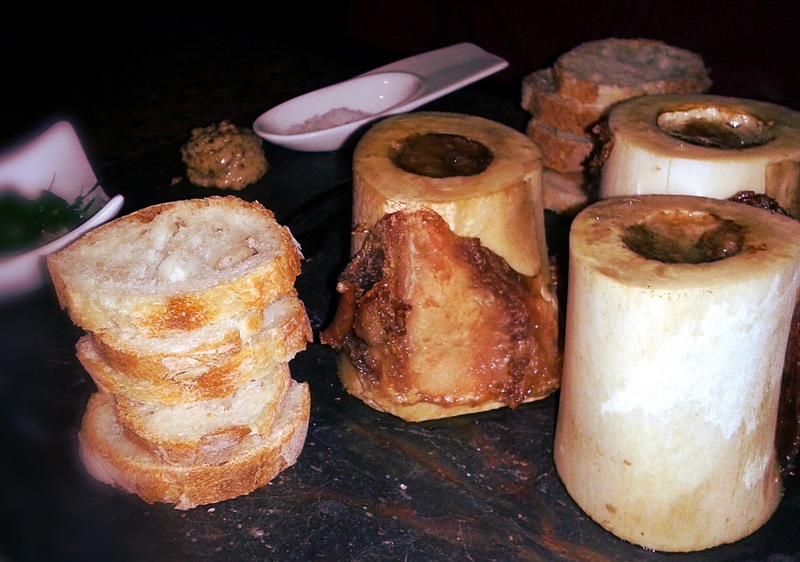 I chose the roasted bone marrow as it had been spoken of on a radio show I had listened to. It had a very rich taste softened a little by the accompanying bread. It was served in the form of vertical bones with a utensil to scoop out the marrow and bread, salt and grainy mustard. They weren't kidding they like to experiment and I found myself being a guinea pig. One day after Robbie Burns day where my only celebration had been to wear a tartan tie I felt obligated to try the haggis. 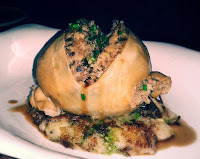 My experience with Haggis is very limited, but their version was easy to take even on an already full stomach. After my verdict they offered it on a chalk board which is how they introduce new menu items. You are often advised to leave room for dessert and in truth it sounded so unique I stretched the point a little. Our choice was a croissant with maple, chocolate and chunks of bacon. As was emphasized this is a place for meat lovers. It was too good to miss. I decided to order wine and they gave me 3 choices of house wines. I chose a Malbec and now I will be looking for this particular brand as it was well chosen on their part. The top photo is one I took at the preview during the art crawl. 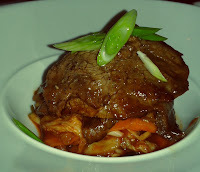 The other photos are from Heather that includes the Korean beef, tongue n cheek, the roasted marrow bone and the haggis. The logo with the pig is from Rapscallion, in Hamilton (John St S) and for meat lovers only I highly recommend it.